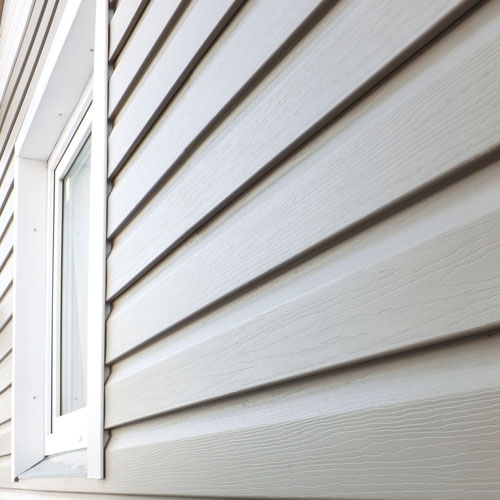 Whether you're building a dream home or renovating one you've loved for years, there's one solution for your homes' exterior that will make it as beautiful, durable and carefree as possible: vinyl siding. Look to Georgia-Pacific brand Vinyl Siding for a complete line of vinyl siding with the colors, profiles, thicknesses and finishes that suit your home and budget. COMPASS™ Vinyl Siding is all about exploring your style and discovering your color. We've handpicked the most beautiful hues straight from nature and recreated them in a high tech low-maintenance product that is engineered for the long haul. With 24 colors, from crisp light, comfy neutrals, dynamic hues and worry-free woodgrains you're sure to find the color that completes your style. Big L stocks COMPASS™ D4 Vinyl Siding in Shadow, Bayou, Teak & Palm in a .044 thickness. FOREST RIDGE® Vinyl Siding is Georgia-Pacific's most popular siding. It's a true classic look on traditional siding. With a broad color palette and a value price, Forest Ridge® Vinyl Siding is the ideal choice for homeowners who appreciate the traditional look and warmth of clapboard siding. Big L stocks FOREST RIDGE® D4 Vinyl Siding in White, Clay, Cream, Tan, Gray, Sagebrook, Briarwood & Pewter in a .042 thickness. PARKSIDE™ Vinyl Siding adds dimension, value and curb appeal to homes of any size and style with its richly embossed woodgrain-style surface. The realistic, deep woodgrain texture resembles the look of brushed cedar. Parkside™ is virtually maintenance-free, with no painting or staining required. Lightweight and easy to install, Parkside can be applied over a variety of substrates. And with its valuable Lifetime Limited Warranty*, you'll never have to worry about your materials investment once your home has been completed. Big L stocks PARKSIDE™ D4 Vinyl Siding in white & clay with a .038 thickness. CALIBER™ High Performance Insulated Siding is designed for year round performance. Maximize the value of your home with this state-of-the-art siding product. It can increase your wall insulation value by as much as 27% plus it has a .044 thickness. Cedar Lane™ Select Vinyl Siding has the natural look of stained wood. When you want the richness and character of natural, stained wood siding without the maintenance hassles, there' no reason to comprimise. It's available in 4 different styles, 7 different colors and a .046 thickness. Shadow Ridge® Vinyl Siding has a distinctive dutch lap profile. A gentle curve at the top of the panel gives a home and old-fashioned dimensional appeal. Homes sided with Shadow Ridge® Vinyl Siding makes a striking statement. Chatham Ridge™ Vinyl Siding has a colonial style which makes it an American favorite. With it's narrow traditional profile it's ideal for enhancing the look of smaller homes. Chatham Ridge™ Vinyl Siding's narrow, 3" Traditional Lap profile gives the impression of colonial clapboard siding. SOMERSET™ COASTAL Beaded Vinyl Siding has a beaded profile featuring a full bead at the bottom of each panel. Somerset™ Coastal Vinyl Siding combines the hand-crafted look of yesterday with the best of today to give any home a sophisticated look. CASTLE RIDGE® Vinyl Siding is classic simplicity meets simple character. A Traditional Lap profile and the look of authentic, freshly painted cedar adds beautiful character to any home. Big L Lumber also is stocking rough sawn pine in 4' x 8' sheets. This is a vertical sheet siding with grooves 12" o.c. A product to paint or stain for a more rustic look. Big L stocks a Vinyl soffit. It is a 3-panel style with the two (2) outside panels solid and the middle vented. Measures 12" wide x 12' long. Aluminum soffit is stocked in the same size as Vinyl, 12" wide x 12' long. Aluminum soffit is stocked as all solid or all perforated. Aluminum fascia is available in 6" x 12' length, although we do stock some colors in 8" width.